Five, sturdy write-on, wipe-off crayons work with our Learning Mats. Specially formulated to wipe easily off most non-porous household surfaces. 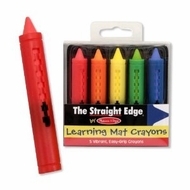 Write On Wipe Off Multi Colored Crayons work well with the Write A Mat items.